On the Oakland artist's work that confronts false security and restricted body rights. 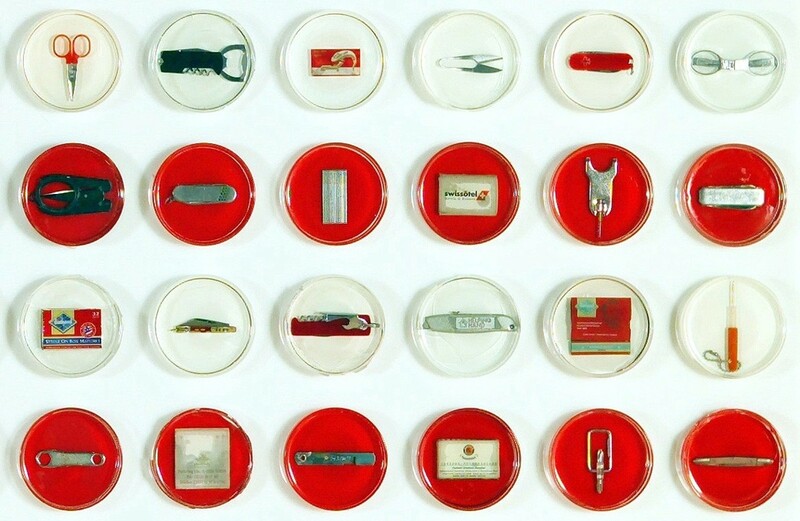 For her 2007 piece "Fear Culture," Pred embedded confiscated tools into petri dishes. Self-manicures became meaningful soon after September 11, 2001, when lotion, shaving cream, scissors, nail files, razors, and other liquids or sharp materials started being confiscated from millions of air travelers. Following the new security policy, Oakland artist Michele Pred, whose artwork often incorporates salvaged or re-purposed items, fought the Feds at SFO to get her hands on passengers' confiscated goods. "The U.S. Department of Homeland Security didn't even have a TSA then," recalled Pred. "It took months of appeals ... Everything was in plastic roll away garbage cans in the metal shop and in dumpsters out back. At first, they only let me look." Pred wore thick gloves for the second visit, and brought a shovel and hardy shoes for the third. Eventually, she also brought friends. "It was heavy. I wanted to get as many things as possible. I felt I needed to be quick. I jumped in the dumpster and shoveled." 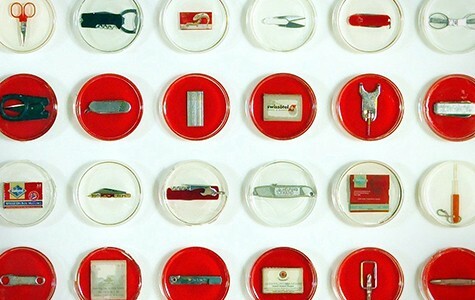 Her efforts resulted in a series of installation works that include "Encirclement," a densely textured piece created in 2003 that incorporates hundreds of confiscated items: sharp metal objects like scissors, corkscrews, jackknives, and politically or literally incendiary objects including matches, cigarette lighters, and squirt guns. It resembles an enormous, spiky, holiday wreath, but strikes a viewer as anything but celebratory. The six large crates in which the five-and-half-foot circular floor piece travels each weigh close to one hundred pounds. "People responded to the work after September 11 with shock and pain. What was taken from them, their scissors and knives, represented to me their freedom taken away," said Pred. "Now, reactions are more everyday. We're used to removing shoes. The thread that continues is the sentimental association. It was anger then, but now it's sentimental: a piece of our naiveté has been taken away." "Encirclement" joins the artwork of fifteen other internationally-recognized contemporary artists and collectives in Home Land Security, a site-responsive exhibit addressing universal themes that include home, safety, individual freedoms, and more. On view September 10 through December 18 at five former military structures in the Presidio overlooking the San Francisco Bay, the free exhibit is presented by the FOR-SITE Foundation, the Bay Area place-based art organization that attracted nearly 900,000 visitors to @Large: Ai Weiwei on Alcatraz in 2014–15. Teh show includes the work of artists from nine countries and is curated by FOR-SITE founder and executive director Cheryl Haines. Pred's works are exhibited in U.S. and international galleries and museums and are in the permanent collection at the 9/11 Memorial Museum in New York. She holds a BFA from California College of the Arts, Oakland, and has been featured by the New York Times, ARTnews, and WIRED, among other outlets. In Pred's warehouse studio, works-in-progress and completed pieces are intermingled with towering racks stuffed with bins containing an odd, but highly organized assortment: purses, wire, birth control pill containers, votive candles, sewing tools, and spray paint. Her work has often focused on women's rights over their own bodies. So, her studio is also home to "Miss Conception," a rhinestone tiara covered in birth control pills, and a half-dozen Fifties and Sixties vintage women's handbags bearing electroluminescent wire messages: "Pro Choice," "Vote," "My Body My Business." Her security-related artwork is ongoing, folding in current-day issues. An open umbrella suspended from the ceiling has bullets on wires that descend like unstoppable rain. It's a recent variation on "Travelers," a 2011 precursor that had airport-confiscated scissors in place of the bullets. Attracted to metaphorically rich objects that suggest layered meanings and offer "a visual dance of texture, color, and repetitive form that's satisfying," Pred said the work is about false security, easy accessibility, and protection. "Ultimately, it's about gun control." Pred grew up in Berkeley and Sweden. Her father was a UC Berkeley geography professor; her mother was a "go-getter" who influenced Pred's definition of realistic, active feminism: if you see an issue that needs change, even if conquering it seems insurmountable, "just go do it and at least try." Pred recalled her earliest hunter-gatherer artistic instinct — collecting barbed wire for a project — and formative family dinner table conversations about Vietnam and civil rights. Despite the serious concepts undergirding her art, humor and warmth are a definite part of its visual appeal: a red, white, and blue flag piece is strikingly cheery. It's only upon closer examination that the "dangerous" confiscated items embedded in petri dishes reveal the assemblage's dark underlayer. Speaking of the purses that proclaim firm, pro-choice messages, she sounded buoyant, not burdened. "I love purses. It's fun to discover them. I want to keep each one." That duality in Pred's approach — hard-hitting and aesthetically captivating — is reflective of her work's overall intent: to show that striking symbols of social constructs are entangled with political and emotional complexities. Combined, the art addresses issues surrounding fear, intimidation, nationalism, governmental intrusion, and restricted body rights. And Pred has clearly been considering the social impact of objects and aesthetics for a long time — what we're asked to give up at TSA or what we're expected to wear in order to conform. She recalled that her earliest activist effort was to demand that her school's uniform code be changed. "Boys didn't have to have them and girls did. That didn't make sense. I petitioned and won," she said. "Changing that was empowering." Correction: The original version of this article included an incorrect title for Pred's work "Encirclement." This version has been corrected.